As most of you know, last spring I purchased a used Aspen Classic camper. It's in great condition and a Brand New cover on it (the cover that goes over the closed trailer. John, I have not had this problem, but then, I keep mine in my back garage. I know that when I used to take my telescope to different events & I when I tarpped it for the night, It would be soaking wet in the morning. I believe that it is just the moister from the ground getting under the tarp. So if you keep your camper outside, this could be the cause. Last fall when I came to the Ill M&G, I had it up for about 2 weeks. I cleaned it with Bleach and water as a maintenance thing. It stayed up for about a week before I folded it up the night before we left for the M&G in the morning. When I got there and popped it up, it was starting to form mold........ It did rain a little, but not enough for wipers or even get the roads wet on the way there, yet inside the folded tent was a lot of moisture. I cleaned it again, dried it really well, folded it up and the next day went out and again there was moister under the cover. I had the cover on it, quadrupled a tarp and put over it and put a car top carrier on top of that!!!! This time, I folded the cover over a little and traced the water back to the seams in the cover where the zippered pocket is. I got some seam seal and am in the process of coating all the thread seams as they appear to be wicking in the water. Sealing the outside of the threads and the inside of the threads so we'll see how that works. I should also say that this morning, I didn't have any moisture inside so I think I may have hit on the problem. Just hard to believe that the thread could allow that much moisture inside in such a short period of time. We will see how the seam seal works. I put seam seal on the threads that are on the zipper flap, let it sit over night and water tested it this morning. Sure enough, was still getting water on on the flap. It looks like it was dry sewn in a few areas, just a bunch of small needle holes with no thread in it. I Sean sealed the whole flap, inside and out today. I think I found the problem!! I have the trailer outside covered just like I always have had, rained most of the night and all day. I went out this evening after the rain stopped and pulled back the tarp and the cover and so far, High and dry!!!! I may have solved the problem!! Now I was thinking of getting one of the "re-Sewn" canvas tops from Trailmaster to replace my canvas, but after seeing what empty needle holes can do, Im not sure I want to deal with a canvas top that has been re-sewn. I just went out and checked the inside of the pocket, and the underside where the tent is and everything is still high and dry!!!! Still amazes me that a few little needle holes would let in so much water......... Hopefully it will remain dry now. Great job and letting everyone else know what resolved the issues. Glad you got that resolved, John ... what seam sealer did you use? I used Gear Aid, "Seam Sure". I got 2, 2oz bottles with a brush tip and it applied really easy and cleans up well if you get any runs or anything. That's the water based stuff and I although the manufacturer is reputable, water based seam sealers are not. You'll have to apply that every year and even then who knows if it will last a season, John! It is way better, sticks to anything (except silnylon, in which case they have a product for that) and lasts forever. It also patches pin/needle holes and seals any of the seams on your camper. The only place around here you can find the seal grip is Richards sporting goods and they didn't have any at the time, that's what I wanted, so I got this instead. Now that I know that's the problem, I will let this ride this season and get a new cover for it this fall. If I find the seam grip in the future however, I will buy a few of them to have on hand, I like that stuff! Went out early this morning after 2 days and nights of steady rain and under the cover was bone dry!!! A few hours later, sun shining bright... I figured I would pull it in front of the garage and open it up and start loading it for next weekends trip. Under the cover....... Soaking wet!!! With the sun out, condensation started o build up fast. I am at a loss as to why this thing condensates inside so much. I got a couple of cans of water proofing spray and prayed the whole cover, inside and out!!! Not sure it's going to do much good on the vinyl outside, but I figured if there are any small holes I haven't found ye, it would seal them. Lets see what that does!!! If it's condensation causing your moisture, won't sealing it make it worse? Seems like you would need the air to circulate. Water was definitely coming in from the threads, so sealing them has helped keep the rain water out, but not all of it. So I sprayed it with water repellent. I completely spray sealed a 5 man Coleman tent years ago the kids used to camp in and it condensated so bad you couldn't sleep in it without getting wet.I think i plugged the pores and it couldn't breath. The spay says that it's breathable. I use the same spay on my frogg toggs and it works great. Rained all day yesterday and most of the night, sometimes it rained really hard! High and dry!!!! Sun was out and no condensation build up........ I may have solved the problem..... I hope so! I called Gary at TrailMaster and he said that he has never heard of a condensation issue with these trailers or covers. I asked him about ventilation and like he said, th cover is vinyl and not suppose to let anything in, including large amounts of air. 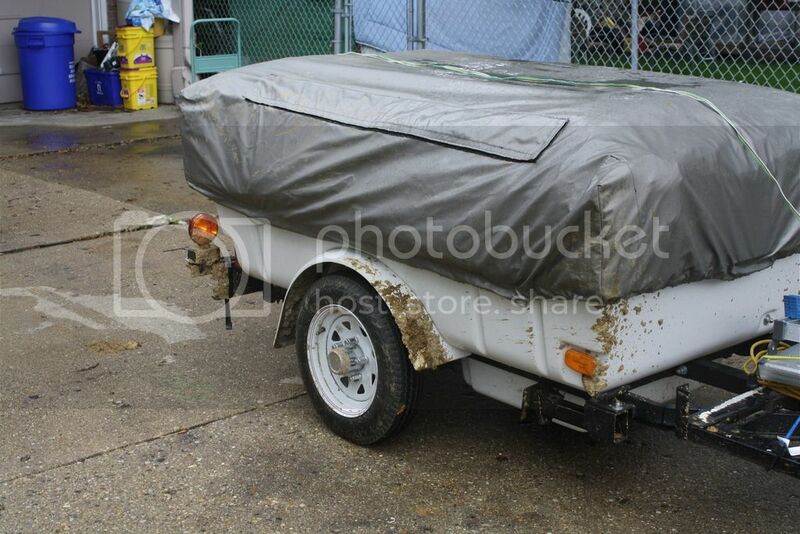 The cover should totally seal the camper, and if there is condensation, that means the water is already present. When I bought the camper, the cover was brand new, never sealed (and stored in a garage). I honestly think that there were a lot of re-sewn areas that left a lot of needle holes. 99% of my water issues were right there at the pocket zipper area. With that sealed, inside and out, nothing is getting in now, so right now, there is no condensation. I will keep checking Richards sporting goods and try to get some of the other seam sealer that works great!! I think it looks ugly after applied, but if it works I don't really care! New covers are $190 plus shipping. I've been following this thread for a while. I have never had moisture issues other than packing it up wet in the mornings after camping. However as soon as I get it home I set it up in my garage for a day of so to let it dry out. I also store it inside my garage with the travel cover on it. I'm not sure how many people store their trailers outside but leaving it outside might be part of your problem. I used to have moisture issues with my boat covered up outside. Well...... Moisture issue seems to be resolved now, have not had one drop of water on the inside of the cover since I sealed it!! I have left it, purposely sitting outside in the direct elements with no ill effects what so ever!! So the new Maroon and Grey canvas was ordered today, along with a new pair of lift struts as mine were dead and no help at all lifting the top up. ore on that when I get ready to install it! Moisture? Our moisture problem is a little more on the solid side. Did I ever mention it is muddy between home and the highway a mile away? Our 19 y.o. Grandson is staying with us for a week and doing some welding projects for us. So the Aspen is his Bachelor Pad. Will have to wash it when it gets folded down. Friday evening before dark he managed to bury the Honda Big Red 3 wheeler in the swamp about 3/4 mile from the gravel road back to home. This morning (Sat.) I dropped him off at the trail head with a 1,000 pound capacity cable winch and 15' of 5/8" nylon rope. Told him we would see him when he got it out. Two hours and 30 minutes later he showed up. Do not know which had more mud on it. The Honda or Him. The Honda got hosed and he went into the pond fully clothed to wash most of the mud off.